...that Zavala and Shaxx are former students of Saladin Forge? "The Leviathan is now home to the last of us true Cabal. We will remember the old ways, for I am the wellspring from which our great civilization flows." The Loyalists are Emperor Calus's loyal followers and guardsmen who serve him aboard The Leviathan. In contrast to the Red Legion, their armor is predominantly purple and gold, and leaves their arms and feet bare. The Loyalists exiled with Calus were all soldiers, and their ranks have since been swollen by deserters from the Red Legion. After the death of Dominus Ghaul, Calus immediately set to work on reclaiming the empire. He gave the now leaderless Red Legion the chance to "join the loyalist regime," sending them on missions to collect geological data on Nessus. These transmissions are intercepted in the Adventure Invitation from the Emperor. Calus intended to convert the soil of the planetoid into "Royal Wine". Calus extended an invitation to The Guardian to board his vessel for slaying Ghaul. 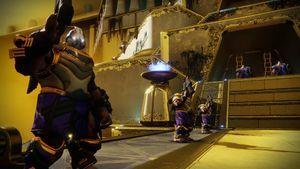 The Guardians accept Calus' challenge and following a long journey through Calus' palace and defeating his loyalist army, the Guardians seemingly meet Calus in person in his throne room. Facing off against the exiled Cabal Emperor, the Guardians witness his strange powers and after dealing critical damage, they find that the Calus they are facing is really a robotic duplicate. Regardless, the Guardians succeed in destroying the robot. Before the machines destruction, Calus boasts about his power and claims to know the "real truth" about the galaxy. Nonetheless, he rewards the Guardians for completing his challenge and offers them a place by his side should they seek him out. The Loyalists have a Psion Council. Early concepts of Loyalist troops, later used to distinguish Blood Guard Majors. A Ceremonial Bather and Royal Beasts. Loyalist troops flanking the entrance to Calus's palace.